The Emmy Award-winning documentary, Best of Enemies, recounts the legendary debates between conservative William F. Buckley, Jr. and liberal Gore Vidal held in 1968 by ABC Television as part of their coverage of the national Democratic and Republican conventions. The film captures the dramatic context of American politics and culture that year and shows how the rancorous sparring in the debates inaugurated a revolution in television programming that not only survives but thrives today. Following the screening, Sam Tanenhaus, who appears as a commentator in the film, and Michael Pressman will discuss the Buckley-Vidal debates in the context of the ’68 election and the political issues of the day, how it was covered by the media, how the tenor of the debates and ratings for ABC affected future television coverage and gave rise to a Point/Counterpoint-style of television programming, and how the debate degenerated into the infamous name-calling. Novelist, essayist, humorist, critic, magazine editor and memoirist, Christopher Buckley, whose books have been translated into sixteen foreign languages will chat with former New York Times Book Review Editor Sam Tanenhaus about his latest novel, The Relic Master. Buckley has worked as a merchant seaman and White House speechwriter. He has written for many newspapers and magazines and has lectured in over 70 cities around the world. The Seattle Times has called Christopher Buckley “America’s greatest living political satirist.” Christian Science Monitor says Buckley “is the Nation’s best humor novelist.” Tom Wolfe says Buckley’s “one of the funniest writers in the English language.” He was awarded the Thurber Prize for American Humor and the Washington Irving Medal for Literary Excellence. Sam Tanenhaus is currently writing a biography of Christopher Buckley’s father, William F. Buckley, Jr. Seating is limited, please call the Library to register. 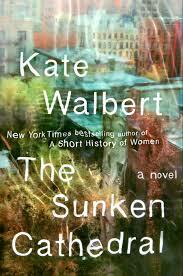 New York Times bestselling author Kate Walbert will read from and discuss her latest bestseller, “The Sunken Cathedral” with Sam Tanenhaus, former editor of The New York Times Book Review at the Essex Library on Tuesday, October 13th at 7 P.M. The duo is certain to provide a memorable evening of literary conversation. “The Sunken Cathedral” has earned starred reviews from both Kirkus and Publishers Weekly. Ron Charles of The Washington Post wrote: “Walbert’s narrative method is a gentle lesson in empathy, a reminder that it’s only artifice and egotism that give us the misimpression that we’re the central protagonist of the life we’re composing.” Library Journal also gave Sunken Cathedral a starred review calling it “An unconventional and unsettling novel with vivid imagery and passages of pure poetry.” “Kate Walbert sees in a manner that exalts the everyday into poetry and gives our deepest desires an unexpected and brilliant expression. She is among our very best writers.” says author Ann Packer. Kate Walbert is the author of: A Short History of Women, chosen by The New York Times Book Review as one of the ten best books of 2009 and a finalist for the LA Times Book Prize; Our Kind, a finalist for the National Book Award in fiction in 2004; and The Gardens of Kyoto, winner of the 2002 Connecticut Book Award in Fiction in 2002. She is the recipient of a National Endowment for the Arts fiction fellowship and a Connecticut Commission on the Arts fiction fellowship. Her short fiction has been published in The New Yorker, The Paris Review, The Best American Short Stories and The O. Henry Prize stories. From 1990 to 2005, she lectured in fiction writing at Yale University. Copies of the book will be available for purchase and signing. Sam Tanenhaus was the editor of the New York Times Book Review from 2004 to 2013. He is also a prize-winning author, and his essays and reviews have appeared in many publications, including The New York Times, The New Yorker, The New York Review of Books, and The Atlantic. He is currently writing a biography of William F. Buckley Jr. This program is free and open to all though advance registration is suggested for this special event. To register, or for more information, please call the Library at (860) 767-1560.